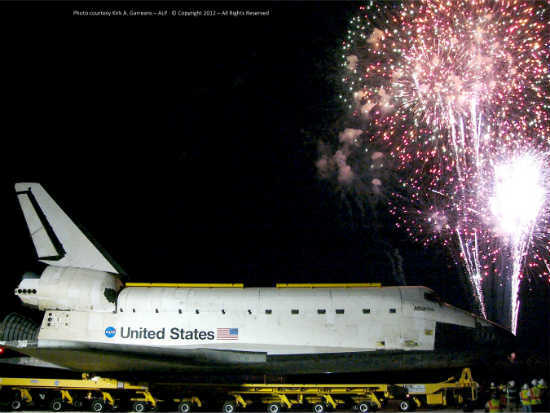 On Friday, November 2, 2012, the Kennedy Space Center launch facilities were left without an orbiter in the program for the first time since 1979. At 6:30am, Atlantis began her 9.8 mile journey from the KSC Vehicle Assembly Building (VAB) to her new permanent home at the KSC Visitors Center just outside the secure KSC launch facilities. As she rolled out of the VAB for her last mission, she was greeted by members of the team that had cared for Atlantis over the years since being put into commission in April 1985. There was a palpable sadness in the air — from the Atlantis team that had put so much of their lives into the orbiter; to the press corps that have covered the shuttle missions over the years; as well as the KSC and USA staff involved in so many launches and landings of the beautiful spacecraft. One Atlantis team member recited this fitting saying, often attributed to Dr. Seuss, “Don’t cry because it’s over – smile because it happened.” It set the mood perfectly in the chilly predawn morning as they watched Atlantis leaving her working facilities for the final time. The workers, some who have already lost their jobs as shuttle operations ended, carried a banner that read “We Made History – Atlantis” as they walked behind the orbiter. Atlantis, the last shuttle to fly in space, rode atop 76 wheels on the Orbiter Transporter System (OTS) for her final journey, with a top speed of only 2 miles per hour. 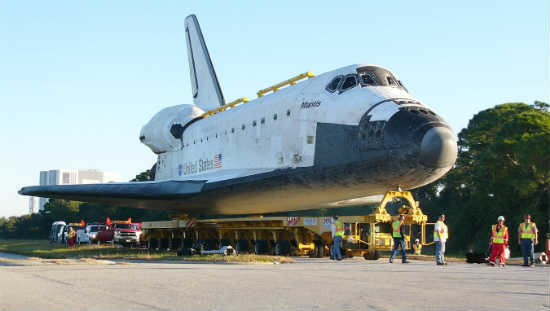 The orbiter weight was 154,000 lbs., and with the transporter, the combined vehicles weighed well over 300,000 lbs. as they made their way on the roads from the VAB to the Visitors Center. In order to avoid having obstacles in the way of her move, 120 light poles, 23 traffic signals, and 56 traffic signs had to be removed to ensure a clear path during transport. The route took the orbiter down Kennedy Parkway, on a cloudless morning, and up over one small hill as she navigated an on-ramp leading to NASA Parkway. The procession, led by the Titusville High School marching band, made its first official stop in front of KSC Headquarters. 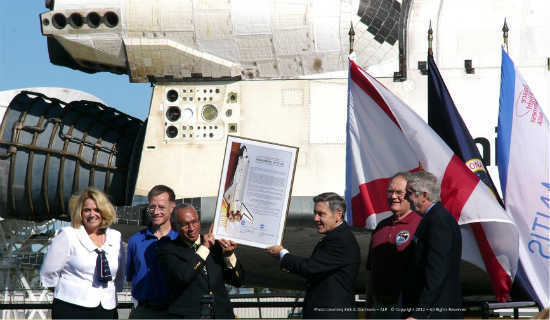 Here, a signing ceremony handing over the orbiter to the KSC Visitor Center was presided over by NASA Administrator Charlie Bolden, KSC Director Bob Cabana, KSC Visitor Center COO Bill Moore, and a host of astronauts that had flown on board Atlantis throughout her 26 year career in space. Once official ceremonies signing were complete, she continued her slow trek through KSC swampland. The next stop was a longer celebration as she left the official KSC secure area and entered Exploration Park, a 65 acre commercial park under development by Space Florida. 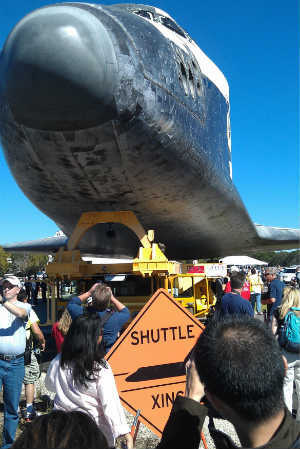 The crowds cheered and crowded the roadside as Atlantis entered the park, and theme music from various space movies and TV shows played through the temporary sound system. At this point, the public was now closer to the orbiter than they had ever been allowed to come, with the wings actually moving over the heads of people on either side of the roadway. While here, Atlantis paused for 3 hours as guests took pictures all around the orbiter, and also explored exhibits of space related hardware from the past, present and future space programs. Exhibitors included SpaceX, Boeing, ATK, Sierra Nevada Corp., and NASA. During this stop, astronauts, dignitaries, and other executives and special guests spoke on stage to the visitors in attendance. The final move of Atlantis took her just west of the Visitor Center. After she turned the corner onto NASA Parkway, she was joined by a cadre of over 30 astronauts from the earliest days of our space program to current shuttle crews. Some notable names included Buzz Aldrin (Apollo 11), Eileen Collins (first woman to command a shuttle), Scott Carpenter (Mercury – Atlas 7), Gene Cernan (Gemini and Apollo missions, and the last human to walk on the moon), and so many more. These national heroes led Atlantis on the last leg of her journey, right up to the gate where she made a final turn into the Visitor Center just before 6 pm. She ended her almost 12 hour journey with fireworks to celebrate the arrival at her new home. It was a bittersweet day, with lots of laughter and tears, and the knowledge that she is ending her space missions, but beginning another mission in education as part of the new exhibit slated to open at the KSC Visitor Center in July of 2013. There visitors will be able to get an up-close look all around the orbiter and learn about the past and future of manned space flight. For more on the Kennedy Space Center, including admissions, tours, and upcoming launches, please visit kennedyspacecenter.com.